More than 1 million to 1 billion Norovirus exists in 1g of vomits (Fluid Substances), and Chlorous Acid Water can inactivate more than 99.99% of the virus which could easily cause infection even with a small amount. ※1 F9 and F2280 strain of Felline Calicivirus are used as surrogate Norovirus. ※２　The fluid substances are general name for body fluid, blood and excreta. 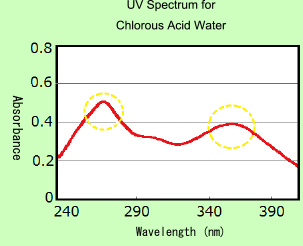 For Chlorous Acid Water, the unique absorption is observed in its UV spectrum at both around 260nm and 350 – 360nm. 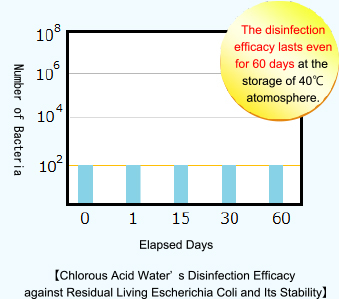 This state proves it to be Chlorous Acid Water. In case such absorption is found around 260 nm for free Chlorous Acid, the absorption around 350 – 360nm is the property of Chlorous acid, not of Hydrated Chlorine Dioxide. 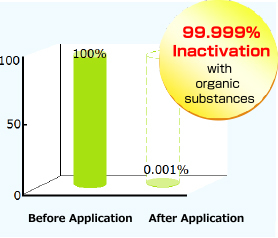 By means of “Cycle Reaction”, Chlorous Acid is stabilized in solution form, and it can maintain its disinfection efficacy even in storage under room temperature. Besides, since even the diluted solution can be stored with good stability, you do not need to prepare it every time before use.